What can be easier than to put label on a piece of information online. Labeling (or tagging) became widely used online and used by websites and applications. At the same time, tagging is one of the most popular ways to classify information. Tagging became a mainstream way to classify information in almost every web application these days. Initially introduced on photo sharing websites, tagging expanded almost everywhere. 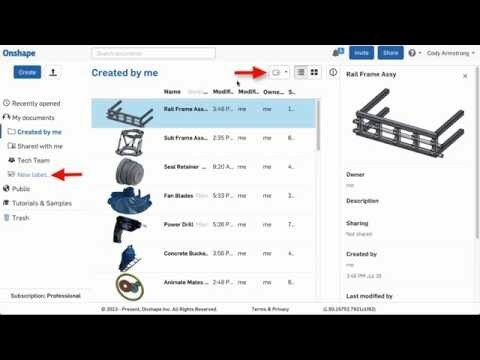 Latest Onshape update demonstrated new “Labels” feature. You can now create and tag Documents with Labels. After creating a Label, it will appear in the Document filter list, making it easier to find. The following short video can give you an idea how it works. Tagging seems to be have some traction as data management option. Tagging feature in Onshape made me think about some interesting aspects of classification and data management. I recall one of my old articles – How tagging can prevent PLM from a compulsive obsessive disorder problem. One of my conclusions back in 2009 was simple – Tag Everything! Now, how can I use this experience to help me to build a more efficient user experience for PLM/PDM systems? My proposal is as following – TAG EVERYTHING – products, models, projects, users, documents,ECOs (Engineering Change Orders), BOM etc. With this total tagging approach, we will be able to build an environment that is tuned for a specific company. What is more important is that it will also be customized for a specific user’s need. Users will be able to build tagging systems within time and justify needs and tags usages. Lately, we can eliminate unused or obsolete tags (even if they were created by a specific user). CIMdata update about Dassault Enovia products – ENOVIA Product Update: A CIMdata Highlight. One of the snippet of this publication referenced to a new solution produced by Dassault – IFWE Compass. Here is a passage speaking about “automatic tagging solution”: The IFWE Compass user interface—This new face of the 3DEXPERIENCE platform was shown briefly at the June Industry Analyst event, but this daylong session allowed us to see it support many more use cases. The automatic tagging and indexing of all managed information (called 6W) should provide significant benefits downstream. This tagging approach is not seen in offerings from other PLM solution providers. Despite visible simplicity, tagging is hard task to accomplish. It required significant amount of data processing, computational power and sophisticated algorithms. But tagging can provide some very interesting results, especially when it is done on the system accessed by wide range of users. I captured 2 empiric examples of tag distribution published online. One of them is an interesting statistic from Flickr produced from 2 million photos. However, the most interesting opportunity for engineering application is to get some insight on how process data in collaborative environment. Due to the increasing popularity of of collaborative tagging, such researches can have relevance for practical application. A special interest can be hierarchy of tags. I’m not sure if the feature is available in any CAD or PLM system, but this is a way collaborative classification can be applied. The following research can give you some interesting ideas and inspiration – Ontologies and tag-statistics. The research paper was downloadable at the time I was writing the article. In most collaborative tagging systems the tagging by the users is completely “flat”, while in some cases they are allowed to define a shallow hierarchy for their own tags. However, usually no overall hierarchical organisation of the tags is given, and one of the interesting challenges of this area is to provide an algorithm generating the ontology of the tags from the available data. Our most interesting finding is that the local relevance of tags in the DAG, (i.e., their rank or significance as characterised by, e.g., the length of the branches starting from them) is much more important than their global distance from the root. Furthermore, we also introduce a simple tagging model based on random walks on the DAG, capable of reproducing the main statistical features of tag co-occurrence. This model has high potential for further practical applications, e.g., it can provide a starting point for a benchmark system in ontology retrieval, or it may help pinpointing unusual correlations in the co-occurrence of tags. Disclaimer: I’m co-founder and CEO of openBoM developing cloud based bill of materials and inventory management tool for manufacturing companies, hardware startups and supply chain. My opinion about BOM can be unintentionally biased. From a “data structures” perspective, implementing tagging of entities is very easy. However, my experience has shown, whether with PLM or any enterprise content management system, unless robust ontologies are developed and users are trained in the taxonomy implementation, the value from tags will be nominal at best. Eric, thanks for your comment! Yes, without good ontologies, tagging can be limited. In my view, an interesting opportunity is to turn collaborative tagging into ontology building mechanism.